I enjoyed this, partly because it covers a period just before I was born which I don't know much about, and partly because it sheds some light on the creation of Python and the relationships within it. 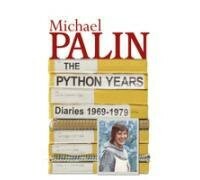 I love Michael Palin, and this book does nothing to damage his "nice" reputation, but that is also unfortunately the main problem with it. He's too nice and pragmatic about EVERYTHING. And because it covers quite a long period of time, most things are dealt with in a paragraph, leaving you wanting a lot more detail. A fun read but a little unsatisfying.